In hindsight, getting through high school is still one of the most arduous experiences I’ve ever had. When I look back, the most vivid memories that come to mind are vignettes of a scared, frightened teenager whose biggest fear was being outed as gay against his will. It didn’t help that the circumstances back then worked against me – I was raised in an extremely conservative family and attended a Catholic school where I basically became the poster boy for ‘most likely to be gay’ due to my lack of characteristics that were deemed masculine. It got to a point where I felt constantly suicidal. I like to think that had the Safe Schools Coalition been in place back then, my high school experience would have been much more positive. Although Cory Bernardi’s smear campaign towards the Safe Schools program is considered old news, the cuts have thrown the government’s role on LGBT issues into the spotlight. The government is not only responsible for deciding who can marry; many of their policy decisions impact LGBT visibility and community. Many have seen first hand the positive effect that LGBT focused programs have on young people in schools. 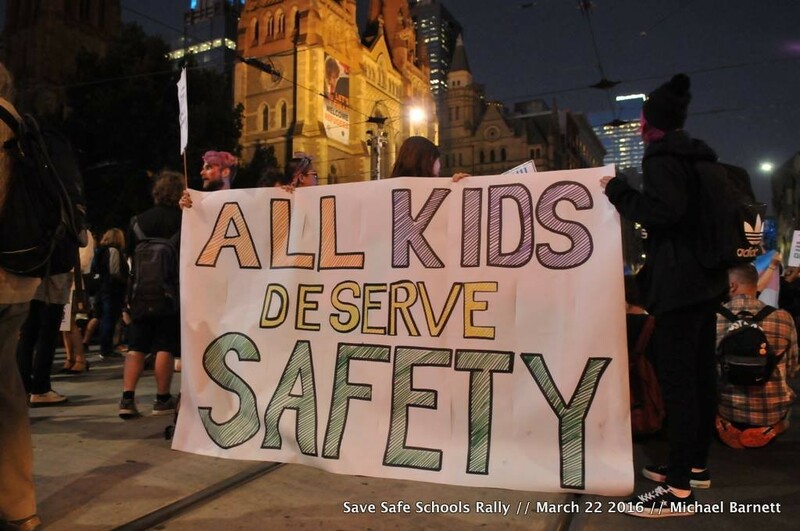 Julia Pavlovic strongly endorses the Safe Schools program and helps organise it at her school. “It’s had a positive impact on our school and on my peers as it has helped them understand gender equality and how to help those who feel alienated in what they are experiencing,” Pavlovic said. Meanwhile, secondary students like Kate*, who identifies as lesbian, can personally vouch for the positive outcomes the program has brought to her life. Lonely and confused, she felt that her school treated the topic of sexuality and gender identity as something completely off limits. This thought echoed even more so during Health classes, where most of the education seemed to relate to heterosexual individuals only. It wasn’t until her school signed up to be a part of the Safe Schools Coalition two years ago that Kate began to feel any sort of representation amongst her peers. Her cohort welcomed the program with open arms, further encouraging the school to have its first IDAHOT celebration, raise money for LGBTI organisations such as Minus18 and update the health books with an additional chapter dedicated to gender and sexuality. Anxiety levels within the young LGBT community have risen exponentially since debates on the Safe Schools Coalition first took centre stage in the media. Queer counselling hotlines like QLife have received a significant increase in distressed calls from young queer people. QLife National Project Manager Stella Topaz notes that QLife has “never been so busy”. “Young people are saying that they are largely supported by peers but they aren’t sure they will be supported by parents, schools, adults and communities,” said Topaz. Despite the increasingly distressed voices of young LGBTI people, the Federal Government recently defunded YEAH, an organisation that deliver effective youth led sexual health education and provide Archer Magazine with office space. Given that over 75% of STIs occur among young people, the government seems to be abandoning an at-risk population once again. The defunding of YEAH, along with the Safe Schools cuts, testify to a wider governmental problem. These cuts target the most vulnerable group in society – young people who require support as they try to establish their individual identity, living in a world that won’t take their voices seriously until adulthood, all the while being wrongly represented by grown adults who do not share their views on wellbeing and health. Ross further adds that the organisation only has a minimal investment for the huge return they provide to young people. YEAH receives less than half a million dollars per annum, with the funds being allocated in developing their workshops held all over Australia, training young volunteers, and providing updated resources to their ever increasing subscriber base. In short, none of the funding they receive is ever wasted. The government’s continued policy-informed attacks on the LGBT community are especially deplorable because those impacted by their actions are the vulnerable youth in our community who need support the most. Aleczander Gamboa is a freelance editor and writer. He tweets under @aleczZzander and tries to figure out instagram at @aleczandergamboa. Click here to sign the petition to save YEAH.